europe | eat. drink. fly. well hello! 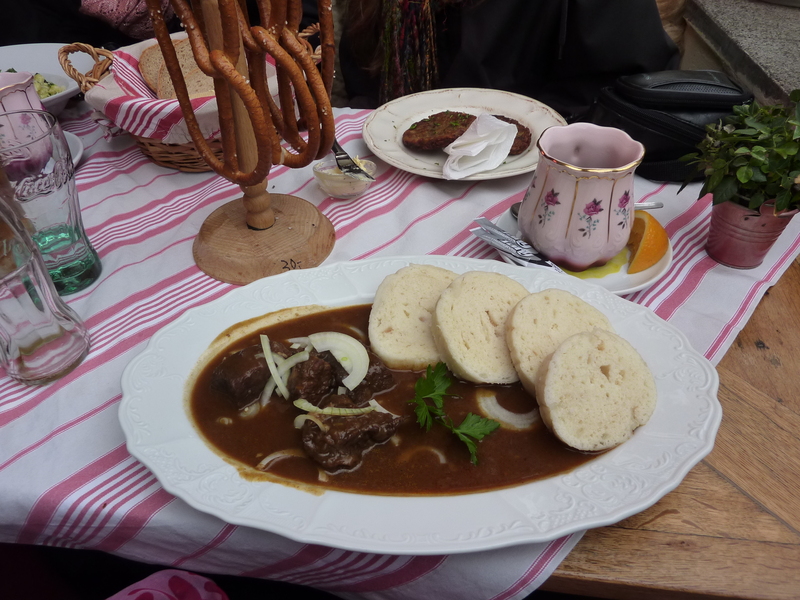 now that my jet-lag has subsided and things are back to normal… here it is… my long-awaited food of eastern europe blog post! it seemed a natural choice that my wrap up of this trip would be all about the food… but what i didn’t realize was exactly how many pictures of food i took… and sorting through them was a bit of a task. and trust, i did take pictures of every single thing i ate… but this is the greatest hits, so to speak. we started our fine culinary journey in prague. 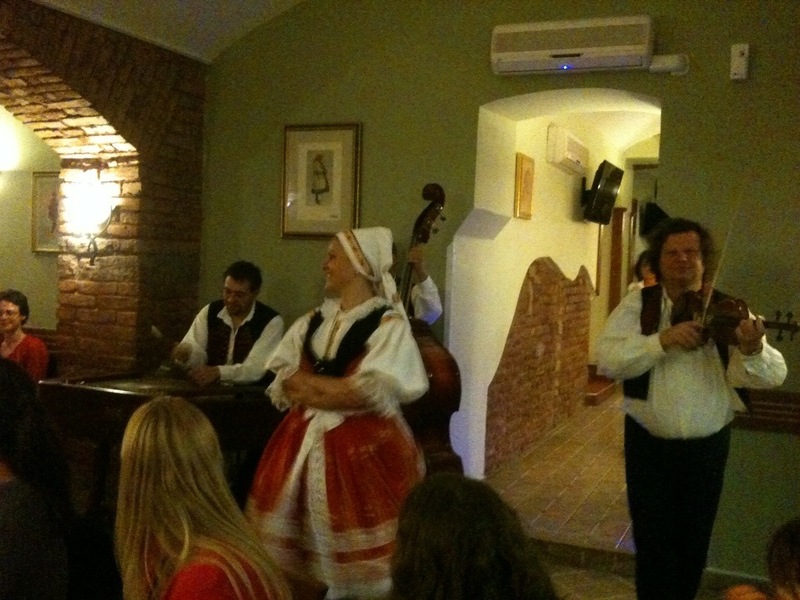 our very first night was spent at a traditional czech restaurant that featured the classics of their culture… this was part of the included meals with contiki and really a lot of fun and delicious! 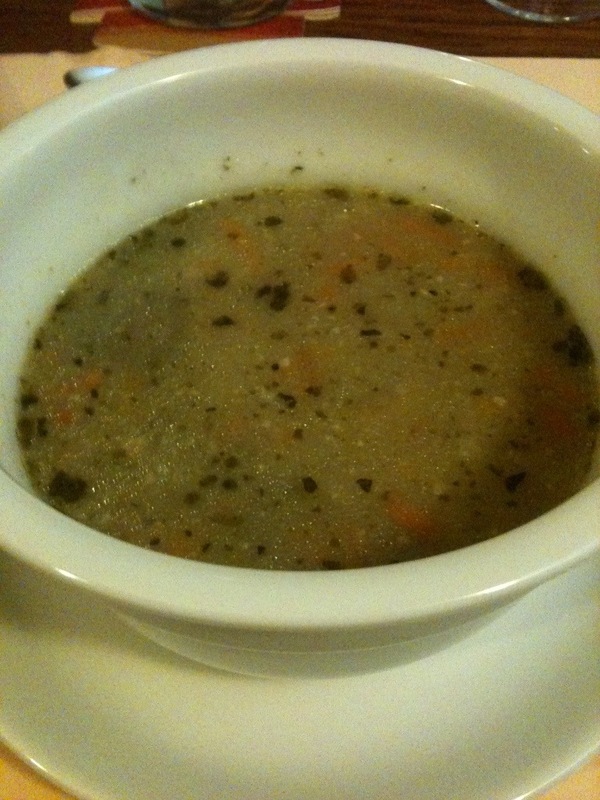 and the soup. 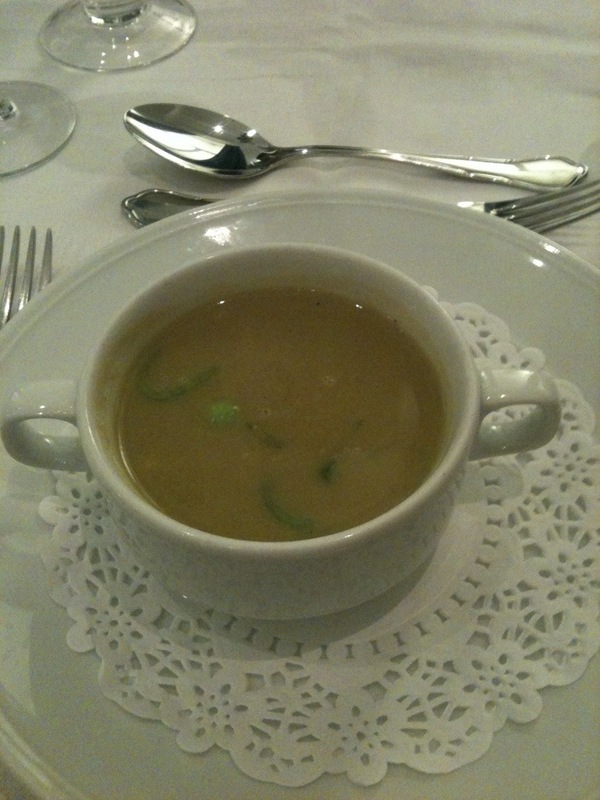 it was a really tasty potato soup. light and well seasoned. and while part of me was a tad disappointed it wasn’t goulash, i realized when the main came that it was for the best. we feasted on duck, sausage, ham and roast pork. and two kinds of dumplings (bread & potato) and it perched on two kinds of cabbage (red & white). ridiculous amounts of meat & carbs. not a green vegetable in sight. welcome to eastern europe. 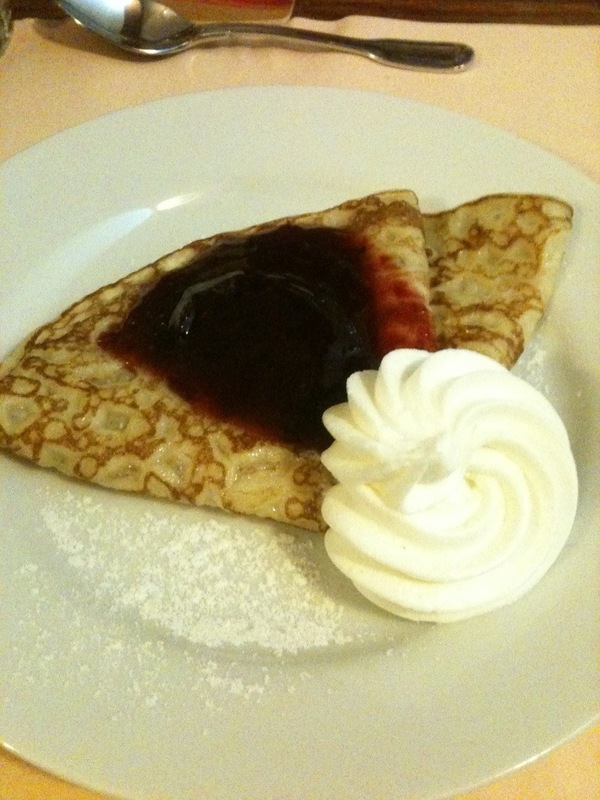 we finished off with crepes & coffee. and i finally got my goulash and dumplings. 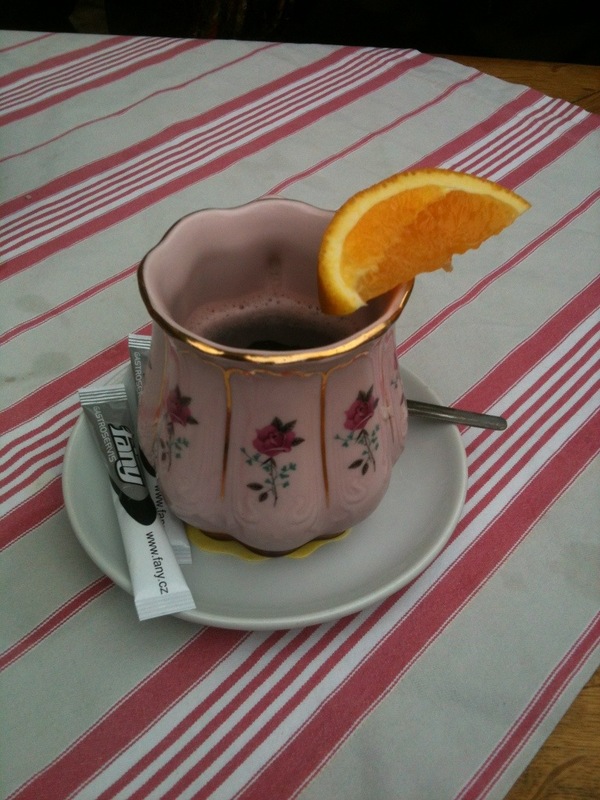 and we also had table pretzels (do not be fooled, they are not free) and maybe my favourite thing of the afternoon – svařák – a czech hot mulled wine that worked wonders for fighting the chill in the air. i really must unravel the secrets of svařák for this winter… i see recipes online and i think its worth experimenting with because it is a delight. 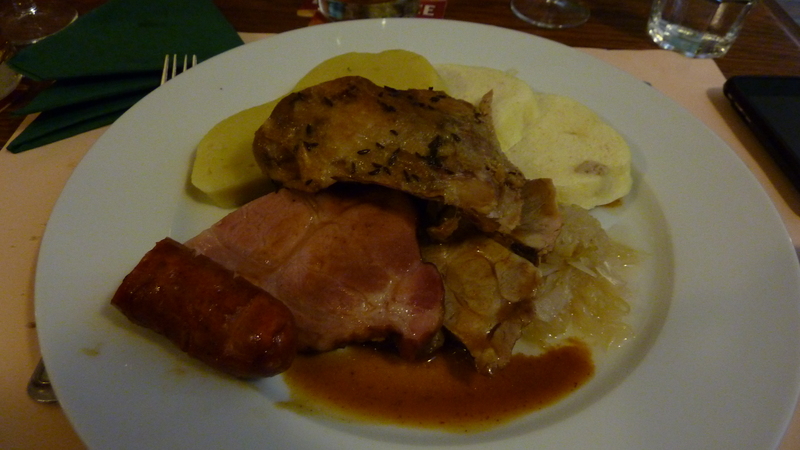 after this meal, i grabbed a cup to go from a vendor and wandered through the fog across charles bridge. this is the stuff dreams are made of, kids. but all good things must… change scenery? sure! off to vienna! 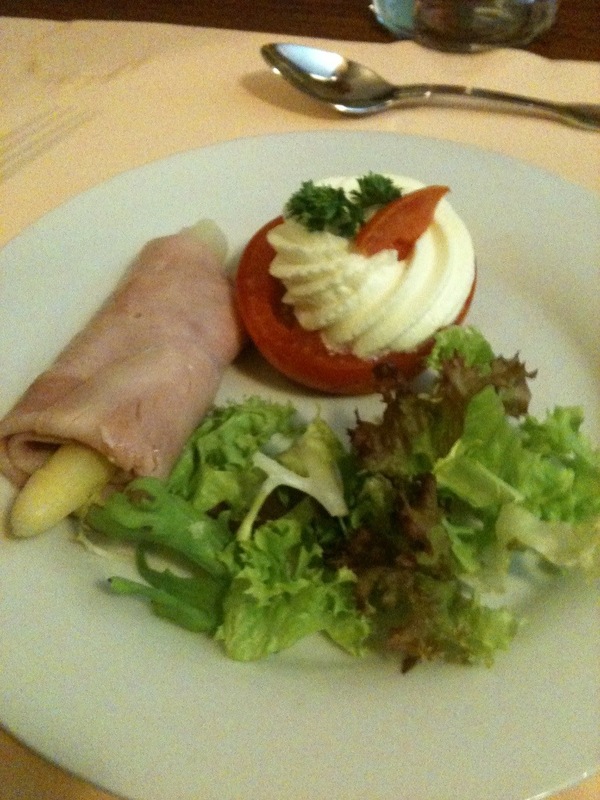 one of my favourite meals of the trip was our first night in vienna. it wasn’t fancy or rich or anything crazy, it was just very well cooked and featured fine ingredients. 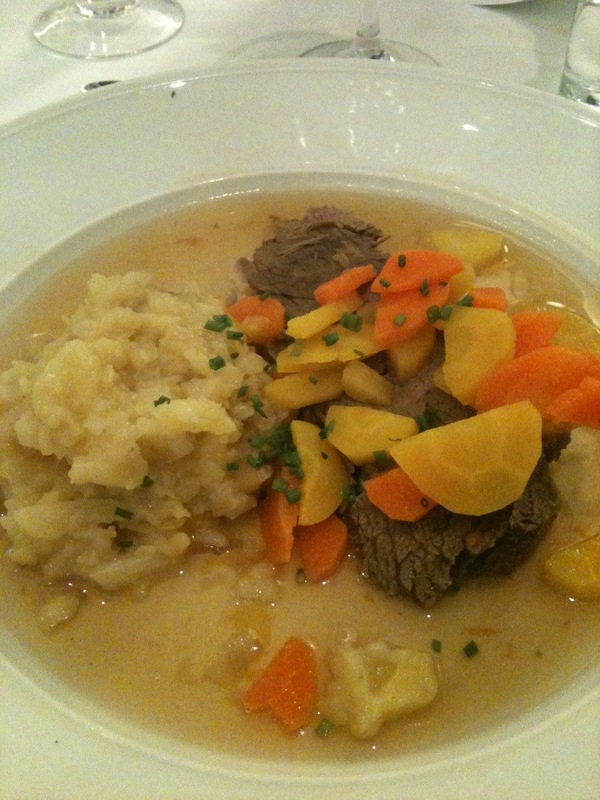 our starter was a delicate leek & potato soup and our main was a braised beef with mashed potatoes and carrots. 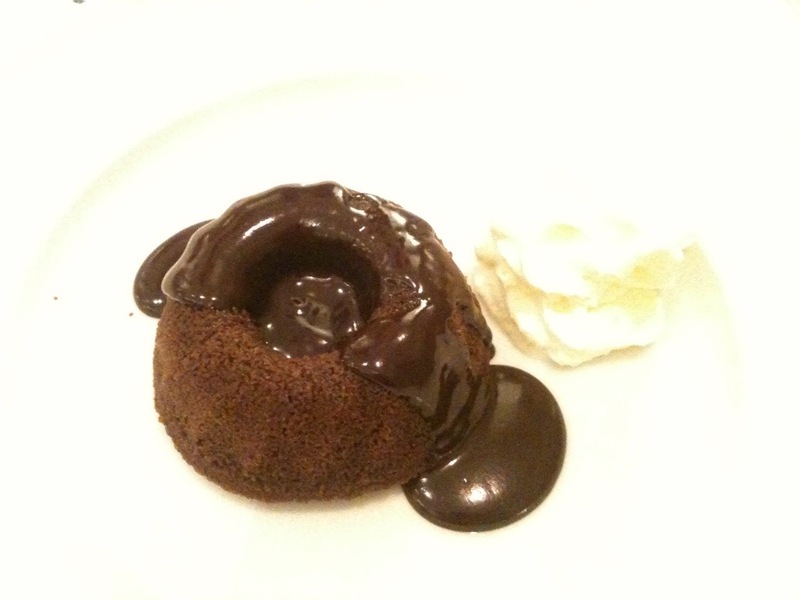 dessert was a decadent chocolate lava cake. 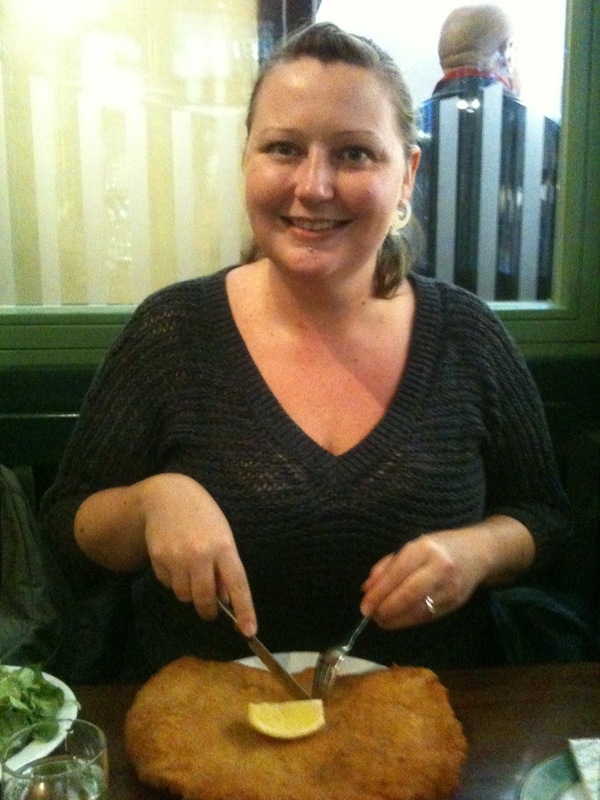 but my most favourite culinary moment on this trip was definitely the schnitzel. 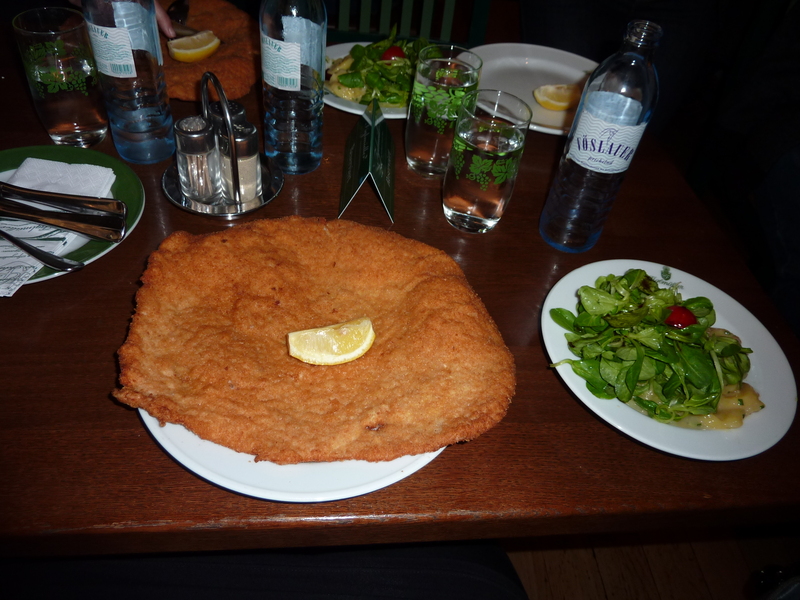 and behold… the mother of all schnitzels. with a side of the most unique potato salad i’ve ever had, topped with lamb’s lettuce. amazing. the most amazing thing about this meal? i actually somehow managed to eat the entire schnitzel. i have no idea how, but i can only take it down to sheer willpower and the fact that my new tour friends were cheering me on. and also because it was so delicious and the thought of wasting it made me unbearably sad. the potato salad was sacrificed. while delicious, something had to give. 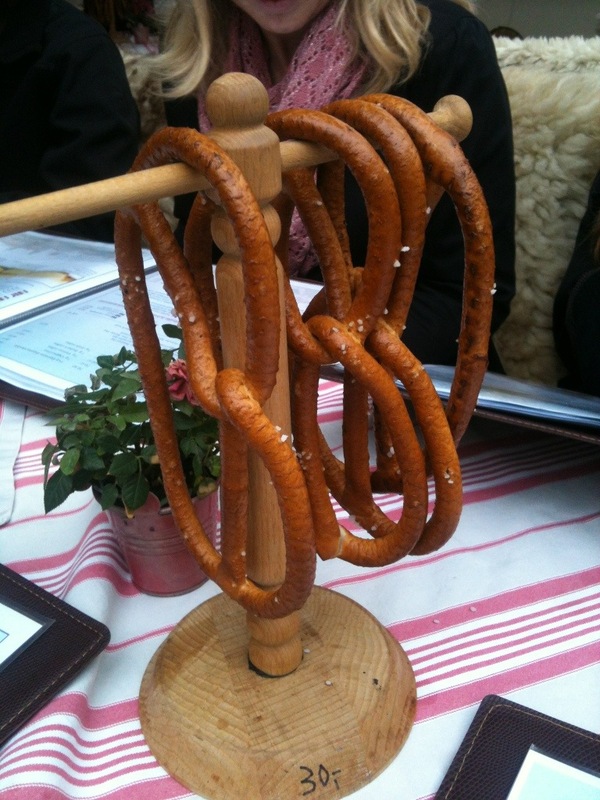 after a brief wander around gorgeous vienna, my companions and i had one more vienna specialty to take down. 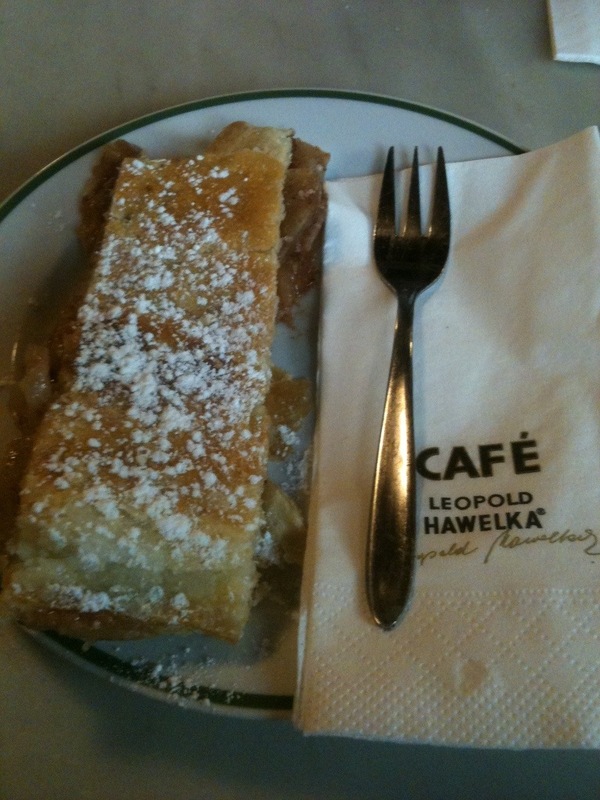 so again, on the advice of our awesome tour director, we headed to cafe leopold hawelka for an apple streusel and an espresso. oh wow. this was an amazing experience on its own. i’m not the biggest apple lover, but this was a pretty special little treat. wonderfully balanced, not sweet and not full of mushy fruit. when you taste it, you know why they say the best in world comes from austria. and of course, i couldn’t leave vienna without one last specialty product… the world famous sacher torte. so i bought 2 sacher tortes and packed them lovingly for home. gave one to my mom and my husband and i devoured the other. it did not disappoint. its hard to describe… so just think of the best chocolate cake you’ve ever eaten and then times that by 10. and add a layer of apricot jam. 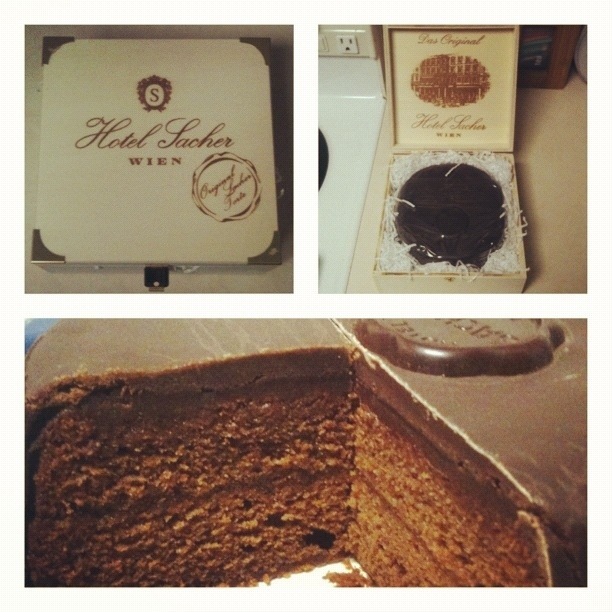 and you have the magic that is sacher torte. plus it comes in a fancy wooden box. last, but most certainly not least… our final stop was when the contiki bus rolled into the gorgeous city of budapest. 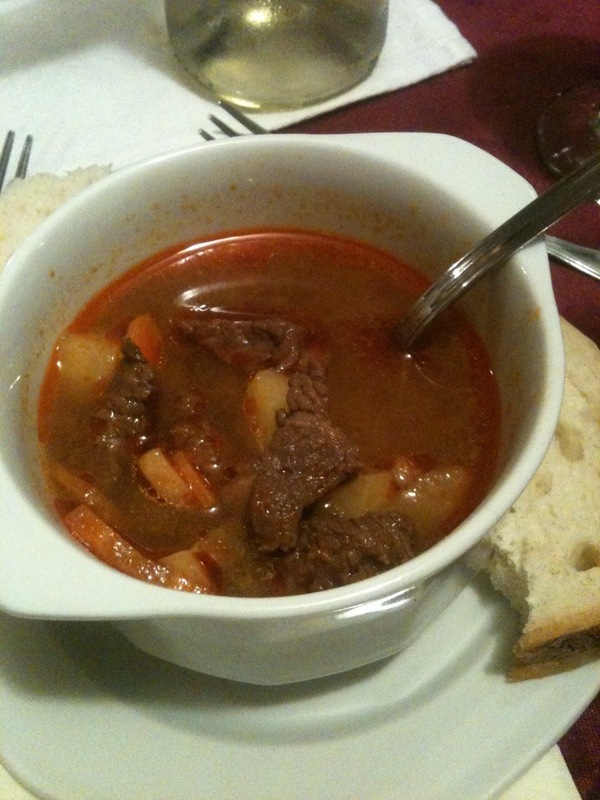 where i once again was on the trail of goulash. our first night we spent on a dinner cruise down the danube and there’s just no words for how stunning this evening was. the food was an excellent buffet of local eats and the scenery was indescribable. 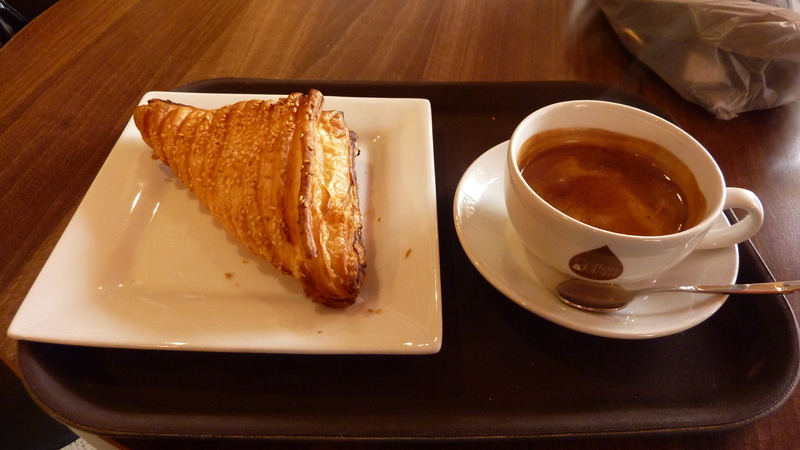 my last full day in budapest was spent wandering the city after a tour of the parliament buildings… and naturally i was powerless to resist a mid-morning snack in the form of pastry stuffed with cottage cheese. seriously, budapest knows the power of the cottage cheese. it’s in a lot of food. and i approve. after snacks, we moved on to check out the food markets… i could do a whole post on the wonders of the market, but since this is a pretty picture heavy post already, i’m going to give you my two favourites. a streusel stuffed with cottage cheese and apricots warm from the oven… and kremes. 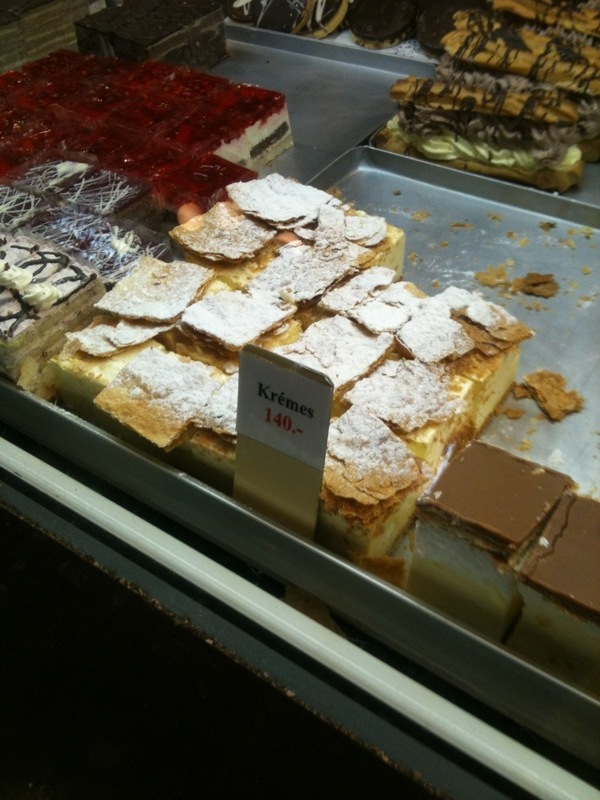 kremes are an emotional throwback for me. i used to work in a slovakian bakery when i was about 19 years old and we served up all sorts of proper eastern europe treats that i’ve never seen since. until this trip. kremes used to be my favourite dessert we made and i sold them by the sheet pan for $2 a square for about 2 years of my life. and i’ve never seen them since. so this was pretty cool to see them in their natural habitat so to speak. anyways, after a trip to the famous szechenyi baths for a few hours of sweet sweet relaxation, we had worked up a bit of an appetite. what could possibly be left to try that you can’t find at home? langos! 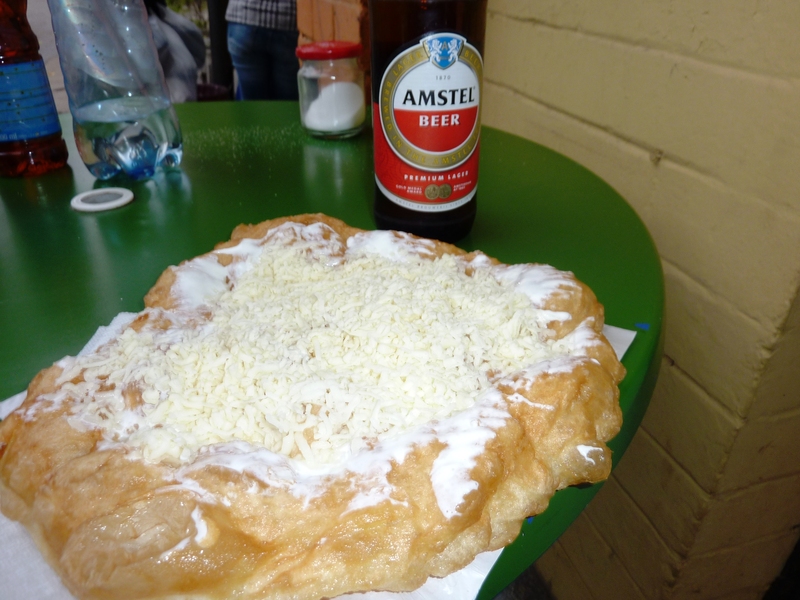 basically you’re looking at a giant piece of deep fried dough (think a savory beaver tail for the canadians) and its then topped with sour cream, TONS of raw chopped garlic and a mountain of cold cheese. the result is nothing short of magic…. 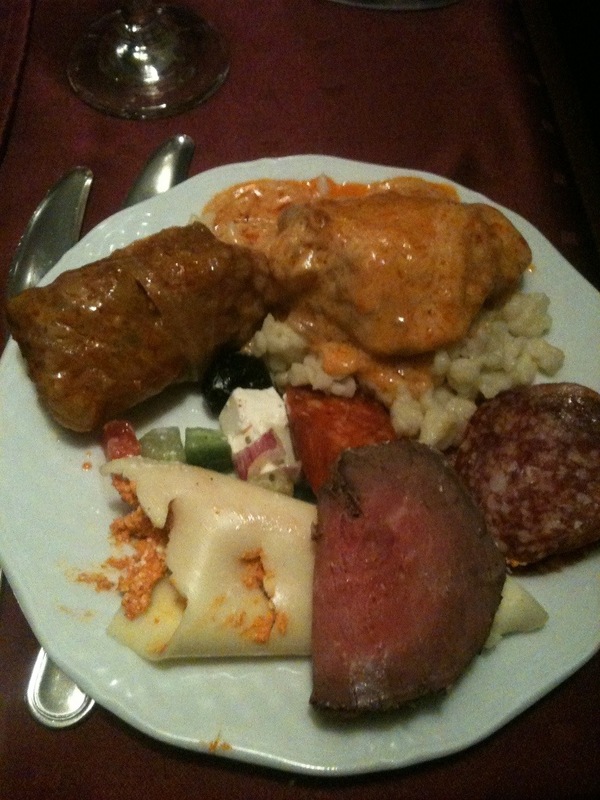 all in all, the food of eastern europe wowed me. it was at times, what i expected, and at other times it caught me off guard. i’m so excited and grateful for all the authentic cuisine that i had access to and truly commend contiki on their great work with sourcing great restaurants and being at the ready to point us towards unique specialty items. as far as culinary world travels go, this was unforgettable and just so unique. i loved this trip. and i’d return in a heartbeat if given the possibility. 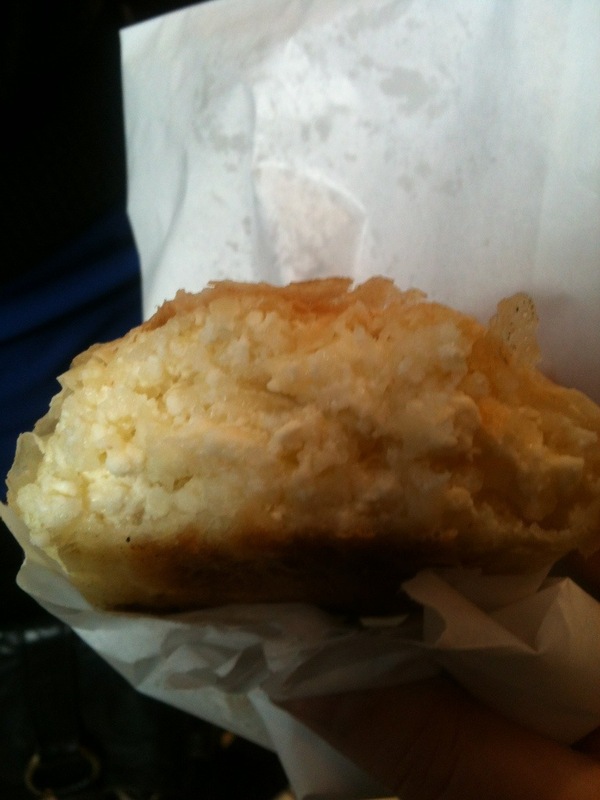 now… to the gym to work off all those langos, lol!